Standardized processes for project management should be part of a professional organisation as well as effectice tools and excellently skilled project professionals. 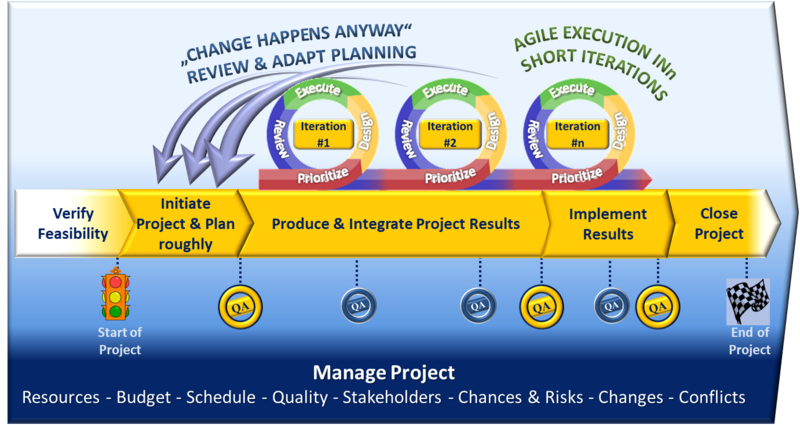 Optimization of existing and definition of new, standardized project management processes along the project life cycle from initiation via planning, execution and implementation to final acceptance and closure. Elaboration of a project management manual to establish uniform wording and understanding. Configuration and optimization of a project management tool-set with techniques, templates, and tools. Our own project process model “Pro-Cedo” rests on standardized models and provides a “out-of-the box-solution” to start off quickly. 2014: A company in aerospace–technology industry launched a project to harmonize project management processes corporate-wide. We were given the mandate to assess processes and to define a standardized process model. Furthermore, suitable software should be selected to support project portfolio management, enterprise resource planning, multi-project-management and commercial project controlling. PMI® and PMBOK® are registered trademarks of Project Management Institute Inc.
2016: A digital marketing agency requests us to elaborate a process model and a guideline for planning and execution of digitization projects. In close collaboration with owners, project managers and project team members we developed a process model based on our „Pro-Cedo“ process model, starting by customer quotation via project kick-off, the design phases to execution, QA and final approval.